A belt buckle bearing Nazi insignia, a shaving brush and a pair of boots were among items found within a sunken World War Two war plane which have helped to solve the mystery of its disappearance. The Luftwaffe plane was found at the bottom of the Black Sea by a team of divers nearly 70 years after it vanished mid-flight. The fate of the aircraft and its nine crew members had remained a mystery since it was reported missing in 1942. Underwater photographer Andrey Nekrasov, 42, was part of the team which found the wreckage 23 metres beneath the surface off the Ukrainian coast, near Odessa. 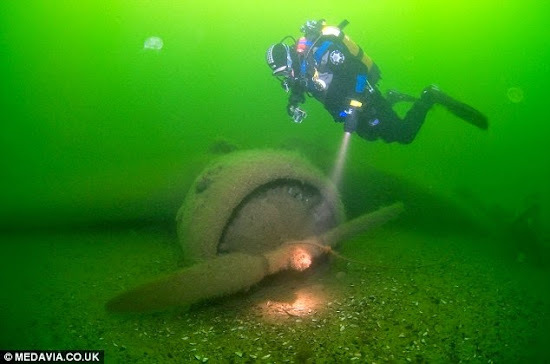 The divers made the discovery while searching for a different plane. Instead of finding the JU 88 they were expecting, they found a JU 52 'Iron Annie', a type used extensively as a transporter aircraft by the Luftwaffe during the war. Since the discovery, researchers have attempted to piece together the fate of the plane and its crew. Mr Nekrasov said: 'There were no records of a crashed plane of this type in this area. 'The wreckage was very deep down so visibility was poor. We could only see three metres in front of us at any time.